Have you driven a 1979 Reliant Scimitar GTE? Fast Cheap Classic — Plenty of electrical falts, as it is a fiber glass body so no good earths in most places in car. Great sounding engine and if you get the galvinsed chassis and stainless steal exaust, you'll never get rust. Pros: Fast, big, cheap to insure for a 3 liter V6!!! Cons: Electrical faults only let down. 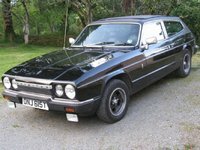 Looking for a Used Scimitar GTE in your area?